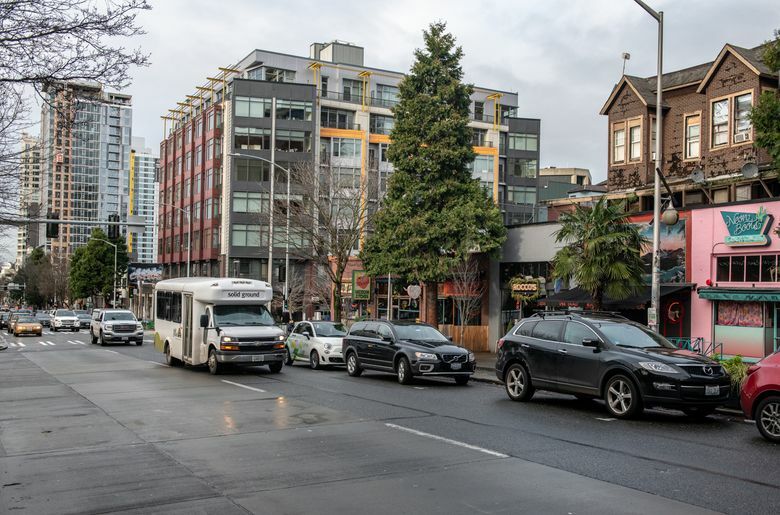 FOR THIS WEEK’S “Now” photo, Jean Sherrard and I are including for somewhat sentimental reasons a third visit to the same Belltown intersection of Second Avenue and Bell Street. The oldest of these three photos looks south through the intersection when the neighborhood was shaped by Denny Hill. This was the northwest “corner” of the hill since razed: Denny Hill. The difference in the elevations recorded here, sometime in 1902 or 1903, and now was a mere 1 foot. 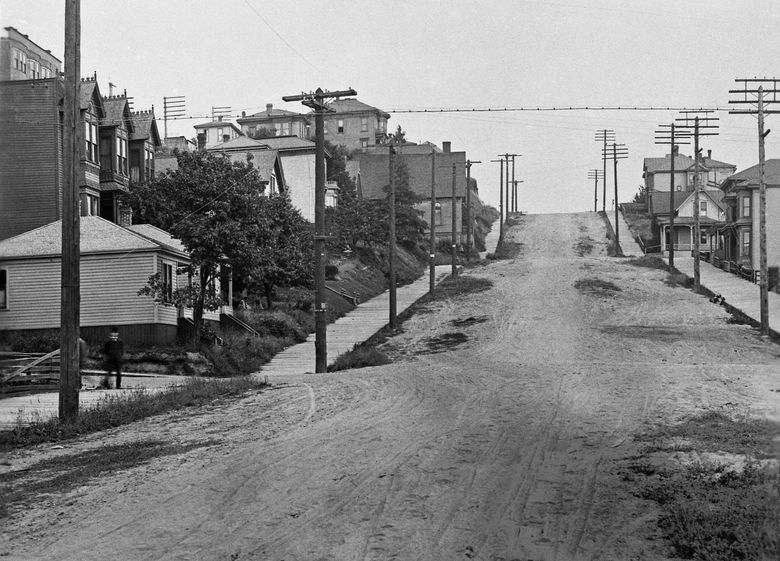 This part of the Denny Hill regrade along Second Avenue began in 1903. It is a rare look into the neighborhood when it was still a hill. John Hanawalt of Old Seattle Paperworks (still in Pike Place Market) first showed it to me in the late 1970s. While I knew nothing about it, I wanted it to be at least part of Denny Hill, the Seattle hill that had been episodically removed between 1876 and 1931. And it was. These two-plus blocks between Bell and Lenora streets were razed to their present elevations between 1903 and 1908. With the photo in hand, finding the intersection came quickly, largely because I liked the bowls of beans, rice and cheese served at Mama’s Mexican Kitchen, still here at the corner of this intersection. Of course, Mama’s was not in the Webster & Stevens Studio photo circa 1902, but the food was on my diet in 1978. 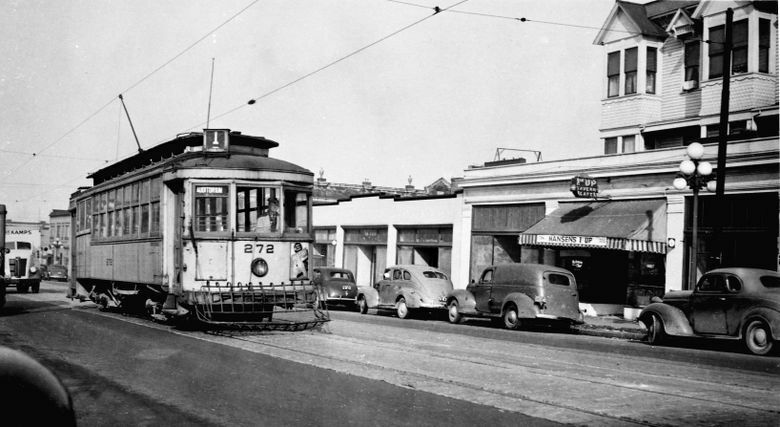 The other “Then” photo (like the “Now” photo, looking north) probably dates from the late 1930s or even 1940, the year many of the city’s street cars were replaced with buses or trackless trolleys. To buy a copy of Paul Dorpat and Jean Sherrard’s latest book, “Seattle Now & Then: The Historic Hundred,” check out their blog at pauldorpat.com.